The Flash is the fastest man alive, and his free slot game, The Flash, by Next Gen Gaming is the most rewarding slot out there. The game hosts a total of 5 reels and boasts fifty bet lines. Players will have the chance to place their wanted bets on these reels by going through the betting options that the game hosts under the reels. The game’s visuals, sounds and symbols are all inspired by the DC universe of The Flash in order to create an immersive and a highly engaging gaming experience that players will never get enough of. The game has plenty of line payouts that players can claim as well as special features and bonus icons that have a lot to offer. For example, there is the wild icon which is the flash symbol that can replace other icons. 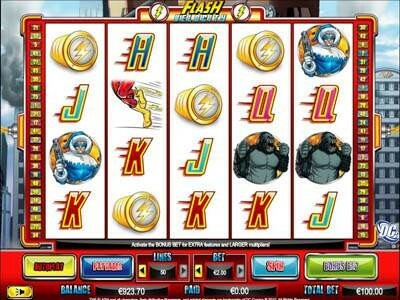 There is also a scatter icon, which is none other than the Flash Logo, which can give scatter pays, trigger bonus rounds and give players a number of free spins on the video slot machine.